Kallio (ER322) of National or the similar commodity is a mail order etc. and often exists. The hair above doesn't cut well though I also used, the nether hair cuts too much, and the hairstyle just becomes like the mushroom. Then, the product was remodeled. It is without relation to barber to remodel it in 1998. It moderately corrects it with scissors using this, and for myself. Please ..hair.. become empty an occasional wife moreover. It is always the same hairstyle and it is possible to exist well if it uses it once every 1-2 weeks. It becomes a saving of the price of a haircut. It might become difficult to move in the blade with remodeling if it uses it though there is no relation. It comes to move very often when the shaver oil is painted on the blade. Sharpness improves, too. Four sticks with long part applied to the hair are removed as shown in the photograph. Please leave a little and cut it out. I cut too much, and became fixing stopped with the machine screw. It puts in the whole and to make the hair long, the spacer made from the vinyl code is put the main body and between adaptors of the adjustment of the hair. The stick of the third row from long one was shortened a little. You seem should always make the length adjustment that cuts the hair long one. Ni-Cd charger (BQ-500) has been remodeled for the nickel hydride. Charger (BQ-500) of the nickel cadmium alkaline battery of National can charge with 006P and the NiCad battery of D, the C, and the AA. It is necessary to charge with about twice time putting it to charge with the Ni-MH battery often used with the digital camera etc. recently or to buy the charger newly. To charge with the Ni-MH battery of the AA, I remodeled BQ-500 of National by the simple expedient. Details are as follows. 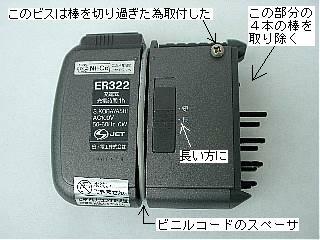 Moreover, to charge with only one chargeable battery, the battery of the dummy was made with four diodes and capacitors. An one alone BQ-500 cannot be charged. It paves ..plastic board.. below, and it ..battery of the AA.. has it at the point of contact for D and the C. It is possible to charge it at the same time by making two by 4 pieces in a left photograph though it puts only in two right. How to make the dummy connects all capacitors of this and 2200 micro farad in parallel making two one that two silicon diodes were made a series. The diode is mutually made the opposite direction. It is applied to become 1.2V the twice directions of easy flow of the silicon diode the voltage descent 0.6V. 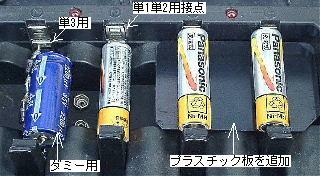 To make them behave to the last like the battery, the capacitor is put. Interior of the building has recently been used a lot of gypsum board finish wallpaper. Detector is essential to find the underlying base material of the board. When to use a detector, but forgot to switch off, it is often the battery to have disappeared. I remodeled it to the thing that it did not forget to turn off this switch. It finds it useful very much though it is easy. This can be applied also to other tools. I similarly remodeled the switch of an old electric field strength meter. The push switch of the sleep return is installed in left side as shown in the photograph. I turned on the switch named AB2111 of National. 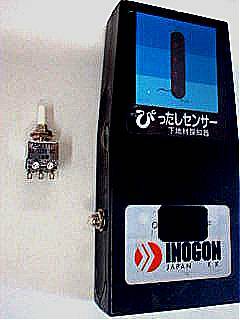 Because the axis of the switch is long, it is shortened only to be able to prevent the switch from entering even if the thing is hit a little. For father, making a lot of sweet potatos, making it a roast sweet potato, and giving to a lot of people are the enjoyments. Because father made the stone roast sweet potato machine using one's initiative, it introduces it. 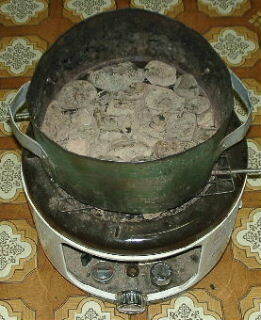 It is put to apply the knob to the frame that puts the net of the rice cake grilling on the kerosene cooking stove and makes it from the tinplate as shown in the photograph. To take it, the net and the frame are bound with the wire. The stone that has been picked up in the river is spread in the frame. Moreover, the partition board made from the tinplate is put. Toride where the metal is long as possible to be taken it out to the center of this partition board even if the board is hot is put. The sweet potato seems to be arranged, to be put on this board, to do the lid up, and to burn. The board and the lid are removed in the photograph. In my home, it is possible to store it by making a special basement storage that stores the sweet potato until the spring of every year. When it is very delicious, it is famous.